Exhaust duct has a diameter of 15.2cm (6") and connects to a chemical-resistant smooth bore PVC hose. Bright white work surface features a lower horizontal airfoil with an armrest. Extraction unit suction speed may be adjusted from 0–250cfm. 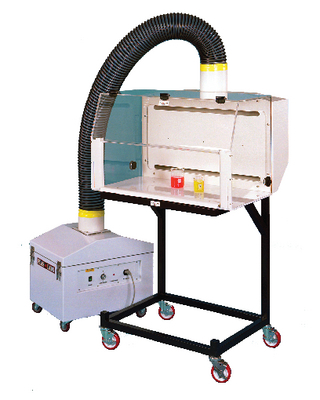 The fume hoods may be used with an existing exhaust system or can be used with the variable speed extraction unit, which can house various types of filters, such as the HEPA or carbon filters. Filters measure 30.5x61cm (12x24"). Powder-coated transport carts are cushioned and feature casters with locking brakes. The safety enclosure has rounded rear corners to help guide the inner atmosphere into the rear plenum. The front viewing sash on the main fume hood features three-position set hinges. Filter suction housing of the fume extraction unit is constructed of chemical-resistant polypropylene.